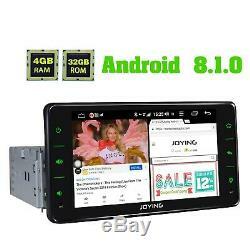 Joying 6.2 inch android 8.1 single1 din GPS car stereo navi stereo usb multimedia. System 8.1 oreo android. User interface design (ui) smarter. 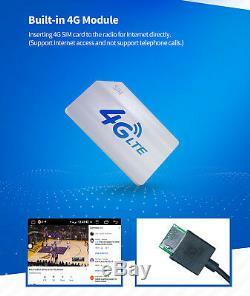 Integrated module of 4g, support internet access with sim card. 70 kings of languages, including English / German / Itlian / French / Spanish /, etc. Yes (set according to the requirements). Protocol of sd 3.0. Usb / micro sd slot maximum compatibility. Up to 64gb Hard disk up to 500GB. About 1 - 2 (2nd start time). On 30-40s (1st boot time). Output of four speakers fr / fl / rr / rl. Digital capacitive touch screen hd. Support a main screen off. Predefined button LED color options. Audio & video & radio. Compatible video formats usb / sd. MP4 avi mkv wmv rmvb mi / gal ... Web video and 1080 video decoding. Mp3, wma, ac3, ape, ogg, flac, web video and etc. Jpeg, bmp, png, tiff and etc. 9 different styles for your choice. Yes, with sub volume differentiated setting. Some stations in memory and. Russa, Japan, Europe, Latin, Switzerland Nxp tef6686, with a high quality reception. 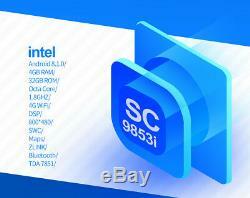 Support the bluetooth phone directory feature. Bluetooth 4.2, hfp / hsp, a2dp, avrcp. Sopport if the car has canbus you will have to buy canbus decoder at dawn this funtion. USB support dab (not included). Gsm850 egsm900 dcs1800 pcs1900 - 2g. Band1 wewayakai2 band5 band8 - 3g. Band34 band38 band39 band40 band41 - 4g. Band1 wewayakai2 band3 band5 band7 band8 band208 - 4g. The newest android 8.1oreo. Accent is about autonomy, speed and security, giving us more control over the various applications. Speed ​​up the operation and keep your device safer. Control favorite features with simple voice commands, easily make calls, use cards, listen to music, to access messages. Built-in microphone in the control panel for hands-free function. Support bluetooth phone call, hands-free calling, phone book and call log; Supports bluetooth music, view the title song, name of the singer. Note: bluetooth is just for streaming audio and it does not support file transfer or internet attachment. Pre-installation google map apk (without offline map data), you can enjoy google maps online. Also, we can provide you an offline maps for you. Download and test after you place order. Optional accessories (support & optional). Dab +: it has a clear sound; super strong anti-interference; faster switching radio stations. Obd2 (pre-installed android torque): it is connected via bluetooth to retrieve real-time data and codes from the vehicle's computer failure. Dvr: it can work in the background, you can save the data while using other applications. Rear Camera: Only support rca-type reversing camera input. Note: It only supports joying car accesorries. Comes with universal iso beam, special harness not your car. For installation you can buy installation frame kit, special iso harness, amplifier adapter or decoder bushing which according to the situation of your car. 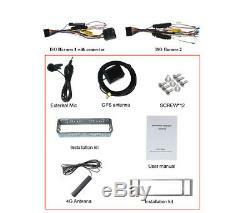 Does not support original car GPS antenna, backup camera, bluetooth, usb, micro etc. The package does not come with the dab +, obd2 and backup camera, you will have to buy them separately. The new joying unit now comes with a spdif digital audio output. For ultimate sound quality, you can connect your external amplifier / dsp to the digital output spdif directly; if your external amplifier / dsp does not come with spdif input, you will need to connect to the amplifier / dsp via fl / fr on & rl / rr outside. 1 x antenna lte 4 g.
Android 8.1 oreo system. Smarter user interface (ui) design. Built-in 4g module, support internet access with sim card. 70 kings of languages, including english / greman / itlian / french / spanish /, etc. Yes (set according to requirements). Usb / micro sd slot maximum compatibility. About 1- 2s (2nd boot time). About 30-40s (1st boot time). Hd digital capacitive touch screen. USA, Latin, Europe, Russia, Japan. Nxp tef6686, with high quality reception. USB support dab (not included). Gsm850 egsm900 dcs1800 pcs1900- 2g. Band1 band2 band5 band8- 3g. Band34 band38 band39 band40 band41-4g. Band1 Band2 Band3 Band5 Band7 Band8 Band20 Band29a- 4g. The newest android 8.1oreo. Focus is on battery life, speed, and security, giving us more control over various apps. Speeding up the operation and keeping your device safer. Controlling favorite features with simple voice commands, easy to make calls, use maps, listens to music, to access messages. Built-in microphone in the control panel for hands free calling function. Note: the bluetooth is just for audio stream transfer and it does not support or transfer internet tethering. Pre-install google map apk (without offline map data), you can enjoy google online maps. Also we can provide you offline maps for you to. Download and test after you make order. Dab +: it has crystal clear sound; super strong anti-interference; faster switching radio stations. Obd2 (pre-installed android torque): it is connected via Bluetooth to retrieve realtime data and trouble codes from your vehicle computer. Dvr: it can run in the background, you can record the data while use other applications. Rear camera: only support rca type reverse camera input. Note: it only supports joying car accesorries. Comes with universal iso harness, not special harness of your car. 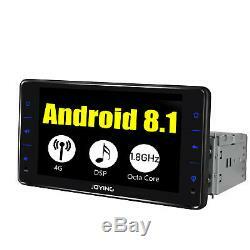 Does not support original because GPS antenna, reverse camera, bluetooth, usb, microphone etc. 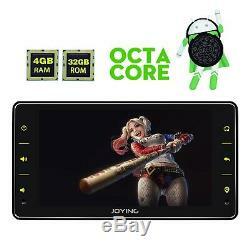 The new joying unit now comes with digital audio output spdif. For ultimate sound quality, you can connect your external amplifier / dsp to the spdif digital output directly; If you do not have any input with spdif input, you will need to connect the amplifier / dsp via fl / fr out & rl / rr out. Thank you for your understanding and supports. If there is any delay, it can be caused by. If you still can not receive the item within 20 days, please ask for help. We try our best to make your products as soon as possible. If it's damaged, please refuse to accept it. Condition of sales payments should be received within. During the duty time, we can give you a quick reply. If we are out of work, please kindly give us a little more time, thanks for your supporting! With 14 years in the development of multimedia, the production of high quality products and products. We will help you solve your problems. And really appreciate if you can shoot a video to share your installation and use experience of joy android car stereo on youtube. The item "joying 6.2 inch android 8.1 single1 din gps car stereo stereo multimedia usb" is on sale since Friday, February 15, 2019. It is in the category "auto, motorcycle parts, accessories \ car radios, hi-fi, video, gps \ multimedia embedded \ main units stereo systems ". The seller is "joykeepstereo" and is located in Hong Kong. This item can be delivered anywhere in the world.